It is a well-known fact that Bangladesh is a highly flood-prone country. As the result of annual floods, significant number of houses in the countryside as well as in urban areas is being destroyed annually. In recent floods during year 2004 we have seen a total or partial destruction to significant number of rural houses making about 1 million people homeless. To a large extent, the patterns and causes of destruction seem to result from poor technical knowledge and wrong perceptions. There is no adequate support for housing projects for low-income, flood-vulnerable communities through development projects undertaken by NGOs and the government, and dwelling houses in rural areas and urban slums are mostly owner-built without proper technical guidance. ADPC under its Asian Urban Disaster Mitigation Program (AUDMP) has supported CARE Bangladesh in implementation of Bangladesh Urban Disaster Mitigation project (BUDMP) in six municipalities. 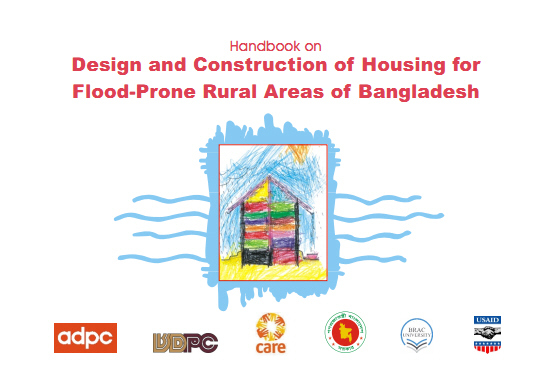 One of the AUDMP findings of post-disaster losses of the housing stock in Bangladesh after 2004 floods is that most of these designs are prepared by people who are not trained as building professionals, so when implemented, many problems emerge. The usual tendency is to apply the same model irrespective of the context. In most cases, the cost is significantly prohibitive in terms of microcredit recovery from poor people and this high cost prevents providing subsidized housing to a large number of people who need them. There is thus a need for developing housing which is appropriate for flood-prone areas, where the suggested solutions can be made 'cost-effective' through rationalization of economy without compromising quality.